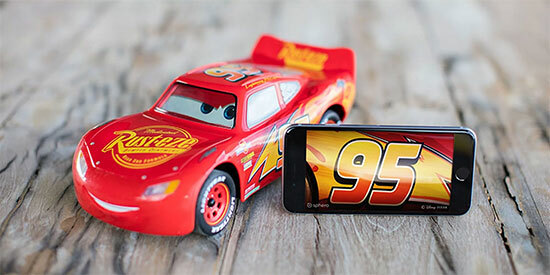 Ultimate Lightning McQueen is the top of the line racer that’s packed with personality. This feat of technology brings the beloved character from Disney Pixar’s “Cars 3” off the screen and into your home. With animated eyes, an animatronic mouth, and emotive suspension, experience Lightning like never before. Ultimate Lightning McQueen is the top of the line racer packed with personality. With animated eyes, an animatronic mouth, and emotive suspension, experience Lightning like never before. A seven-time Piston Cup Champion, Ultimate Lightning McQueen was born to race. Connect to the app, hit the gas, and see Lightning respond to your commands with his personality on display, thanks to emotive actions and speech. Watch him lean into hairpin turns and drift like a pro. When you’re not driving and drifting with Lightning, sharpen your pit crew skills in Pit Stop Panic, create scripts for Lightning to perform in his next Rust-eze spot in the Acting Studio, or kick back and relax by watching Disney Pixar’s Cars with Lightning while he reacts to the movie.